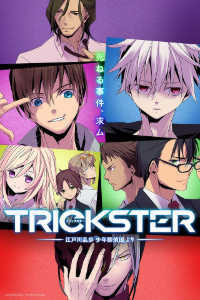 AKA: TRICKSTER -江戸川乱歩「少年探偵団」より; Trickster: From Edogawa Ranpo's "The Boy Detectives Club"
Notes: Based on novel series The Boy Detectives Club by Edogawa Ranpo. Detective Akechi Kogorou is the adult leader of the "Boy Detectives Club", a group of male high school students (MOSTLY, and some don't look it), who tackle tough tasks in 2030s Japan. The show is mostly concerned with the relationship of two within the group, and their changes of status- the descent of the team's "golden boy", Kensuke Hanasaki, into dishonor, and the consequent ascent of the fortunes of newcomer Yoshio Kobayashi, a difficult, uncooperative kid with no social skills and a death wish. Much of the villainy they face is being engineered behind the scenes by a master villain named Twenty Faces. Hanasaki, as I said, is the group's "golden boy" (in an orange jumpsuit), who sports miniature versions of the sort of grappling hooks and cables Batman uses. Early on, a team member I'll say more about, Ryo Inoue, gets a leg cut off (by Kobayashi, though it was not really on purpose), and Hanasaki laughs about it, because the leg was a prosthetic one; but legs, flesh and blood or no, represent mobility, and Inoue winds up in a wheelchair through much of the remainder of the show. This bit of insensitivity by Hanasaki shows that he is a smart a..- ALECK, who needs to be taken down some notches, and boy does the show do that. It seems that Akechi was rather cavalierly concealing some information from Hanasaki that he'd promised to tell him, Hanasaki gets upset when he finds out, AND EVERYONE IN THE GROUP THEN OSTRACIZES HANASAKI! (Nao Nakamura, a detective who works with the B.D.C., says she "can't get emotionally involved", a somewhat hypocritical statement since she's actually in an intimate relationship WITH AKECHI HIMSELF, and I was kind of shocked by this indifference, until I found out that Nao has some other major issues, which I can't say anything else about.) Hanasaki departs from the group and sinks even lower until finally trying to recover, which he does only in stages; one phase includes involvement with some teenage delinquents/vigilantes/mercenaries with their own ideas of justice. I could well believe that the fragmentation and atomization of civil society, fueled by the worst aspects of the internet, could bring about groups like this, so I found them depressingly plausible. I don't believe this show is INTENTIONALLY dystopian (it doesn't seem to have ANY consistent philosophical or ethical view, except maybe at the end), but it often plays that way. Kobayashi is really the other major player in this show, and he's CONSTANTLY a jerk as opposed to Akechi or Hanasaki, who only are sporadically. Kobayashi's "edge" may soften a bit with time spent with the B.D.C. (and when some memories are recovered), but until then he's obsessed with suicide, and only works with Hanasaki because the latter promises to find some way to kill him. You see, Kobayashi is inexplicably surrounded by a force-field that protects him from harm, or even from being touched- except that latter detail is occasionally forgotten, especially near the end, when a villain grabs him. (As with time travel, it's hard to write a consistently logical story involving force-fields, so this show's pretty average in that department.) Furthermore, Kobayashi's force-field's protective power wanes whenever he starts WANTING to live; having a force-field can be bad enough, but having a contrarian one has to be the pits. As noted above, when Hanasaki introduced him to the "club", most of the members (except Akechi) had no great enthusiasm for either his power (too dangerous) or his attitude (WAY too disagreeable), but after Hanasaki leaves they're a bit short-handed, and Inoue, who becomes the de facto leader, finally begins experimenting with using Kobayashi for direct assaults. Inoue is supposed to be a hotshot student who's got a photographic memory, but honestly he looks like he got "held back" several years. I've generally liked Peach-Pit's character designs, but here they've made several of their "teenage" characters look more like they're in their early 20s. There are some other minor characters of interest, including a smarmy one named Ohtomo, the head of the Scientific Experiments Club, who of course ALWAYS wears a lab coat, and who ALSO looks a bit long in the tooth to be a high school student. (I kept thinking of that old Night Gallery episode where they never let those guys out of that private military school, no matter how old they got.) But my favorite character among the less-featured is the only one who is a consistently dedicated public servant, a detective named Miyanishi- and his fate is pretty much a harbinger of the attitude that the show finally seems to adopt, which I found rather disturbing. Well, at least it ultimately has SOME kind of viewpoint at the end, even if it's not one I particularly care for; otherwise, the stories are as bloodless as if an army of vampires had attacked the script. Even when the show has a good idea, the development is flat, devoid of feeling. One of its better story ideas was a "charity" that (supposedly) takes care of aging NEETS. This is a storyline that cried out for black comedy, or suspense, or at least SOME kinds of feelings toward its cast, but it just plays out as a literal depiction of events without inviting any emotional involvement of the audience, with any of the players, AT ALL- and THAT sort of thing is why it took me so long to write this review; if the show doesn't care to make me feel, then I don't feel like caring about it at all. -Some criminals have a paint that makes them invisible. Their idea of the appropriate crime to take full advantage of this? Writing graffiti. -I mentioned Akechi's inability to be shot even at close range. In another case, our heroes are accosted by armed men, and simply run away (or ROLL away, in Inoue's case), and the armed guys DON'T EVEN FIRE A WARNING SHOT! -So we have an aircraft that's falling to pieces, and all on board are understandably in crisis mode, and then suddenly it's, hey, we really didn't NEED those huge chunks of the plane to fly after all, it's all good? REALLY??? Recommended Audience: Kobayashi's attempts at suicide make the show unsuitable for small children OR those who might be tempted to emulate him. Akechi and Nao have an "adult relationship" of which the less said the better. 16+ OK, with the above cautions about the suicide theme.